Finahub Official Blog: How banks can benefit by implementing E-Sign? How banks can benefit by implementing E-Sign? Aadhaar eSign is a Govt. of India approved digital signing service that uses Aadhaar data of the Aadhaar holder to sign digital documents without using any other software. Financial organizations like banks, stock brokers, insurance companies etc. stand the make significant gains by implementing eSign solutions. With eSign, these organization will now be able to make full utilization of their web and mobile infrastructure for providing services to their customers. Following are some use cases in which eSign can significantly improve the customer experience and provide a cost-effective and efficient solution for the organization. 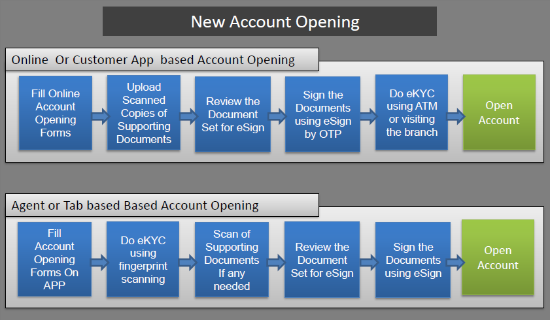 The image below shows a completely paperless account opening process using eSign. For existing customers that avail new services such as car loans, housing loans, credit cards etc. needs to submit a signed application and the supporting documents. The customer can do all this online using eSign without visiting the branch or doing any paperwork. The customer can also submit applications such as Nomination Application, Channel Facility Application etc.without visiting the branch or doing any paperwork. The following image shows the use case of an existing customer applying for a loan using the eSign enabled process. The new loan application can be processed without any paperwork. Legally recognized –Aadhaar eSign is legally recognized under IT Act as a valid digital signature. Finazapp is turnkey eSign solution that make eSign implementation easy and affordable. Finazapp comes in two versions, a hosted solution that gives you complete control on your data and cost effective SaaS version. Finazapp, with its web plugin, eSign mobile App and REST API provides an end to end eSign solution.